Joe Galliani hadn’t finished his presentation to Mattel executives when one of them suddenly held his hand up. Galliani noticed the executive had been doodling anthropomorphic sharks on the paper in front of him. “Best meeting I ever had,” he tells mental_floss. 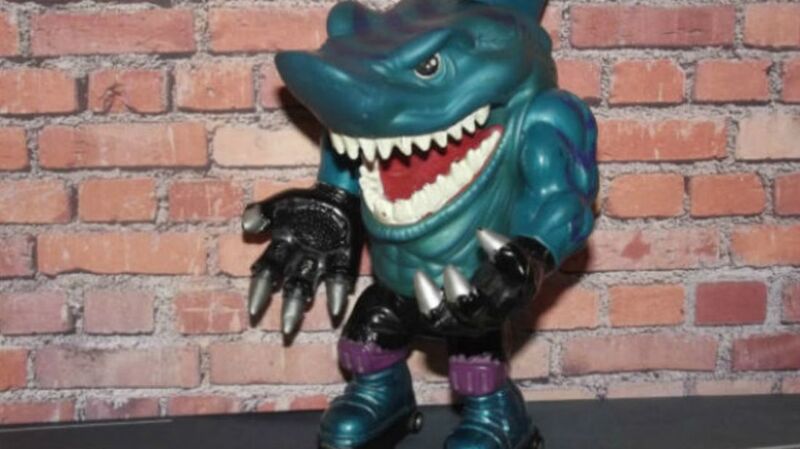 Interrupted in 1994, Galliani—who had started out by arranging displays for Mattel during line preview meetings with toy buyers and slowly worked his way through the ranks—was pitching Street Sharks, an action figure line consisting of humanoid man-fish with various action moves: knockout punches, projectile eyeballs, and masticating jaws. For the 1994 Toy Fair, the company hired a then-unknown Vin Diesel to extol the virtues of characters like Ripster, Big Slammu, and Moby Lick. Diesel’s affection for punching out plastic sharks was shared by Mattel’s demographic: The line grossed $40 million in its first full year out in 1995, besting the Mighty Morphin’ Power Rangers phenomenon in some markets. Galliani credits the success with children's fascination with sharks. When licensee David Siegel asked him to come up with a man-eating property they could sell to Mattel, Galliani noticed that every shark book in the local library had a waiting list. After dissuading Siegel from using a single shark toy mold painted different colors and expanding the line to include hammerheads and other ocean terrors, the two proceeded to sell Mattel, the licensing agent for Teenage Mutant Ninja Turtles, and animation company Bohbot Entertainment on a story about a scientist who is mutated along with his sons into bipedal sharks via a “gene-slammer” and must fight the evil Dr. Piranoid. The toys were packaged in something resembling a diving cage, complete with teeth marks. Some wore rollerblades. The Street Sharks cartoon ran for 40 episodes in syndication through 1997—Galliani was recruited to polish scripts with catchphrases like “Jawesome” and “Fintastic”—at which point interest in the line cooled. Galliani took his share of the royalties and pursued a new pro bono career in environmental activism, heading up the South Bay Los Angeles chapter of 350.org and spreading awareness about climate change. He was as surprised as anyone when video of Diesel’s Toy Fair gig popped up this week.